Skittles Original Fruit Candy are bite-sized chewy candies with a colorful candy shell and fruit flavors, including orange, lemon, green apple, grape and strawberry. Perfect for any party or even just snack time. 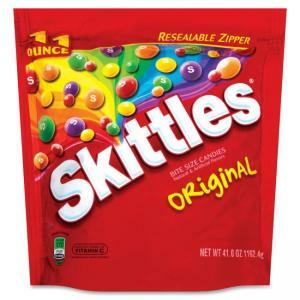 Bag features a resealable zipper to keep the Skittles fresh and ready.